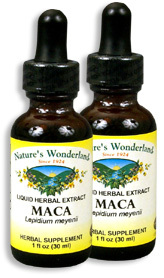 Maca Root Extract, 1 fl oz / 30 ml each (Nature's Wonderland) - Penn Herb Co. Ltd. The 2,000 year-old Peruvian vitality secret is out! The legendary Maca root boosts energy and stamina, enhances libido and helps your body adapt to physical and mental stress. Add several drops of our fast-acting liquid extract to your favorite beverage. Maca is also a powerhouse of essential of essential vitamins, minerals and amino acids. No wonder it’s a popular herbal food to boost athletic performance and overall vitality! AMOUNT PER SERVING (500mg/ml or 30 drops): Maca Root (Lepidium meyenii). OTHER INGREDIENTS: Grain Alcohol (40-50% by volume), Deionized Water. Free of: milk, dairy, egg, fish, shellfish, tree nuts, peanuts, wheat, gluten or soy. Rejuvenative tonic; boosts endurance & stamina; promotes energy; supports male and female reproductive health; supports mental focus; supports athletic performance.